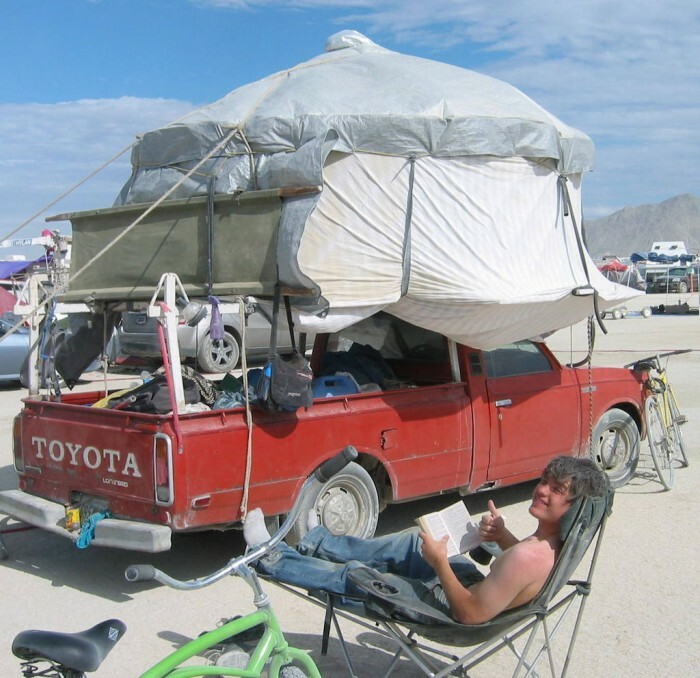 Tim Anderson was thrilled when he learned that he could build his very own yurt using the remnants of an old couch. Have you ever heard of a yurt? These portable, cylinder shaped structures are common among the nomads of Eastern Asia. They have been around for thousands of years and are relatively easy to construct using common materials and simple tools. The design of a yurt makes it able to withstand high winds, and the interior can be insulated for extreme weather, making them perfect for all kinds of camping situations. 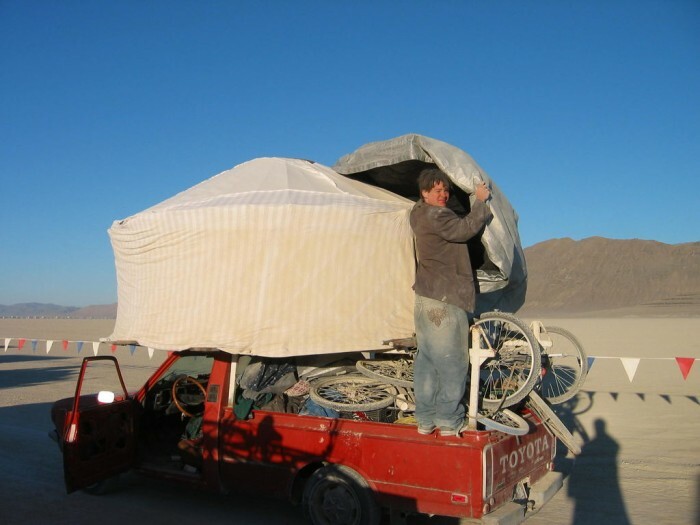 To modernize this concept, Tim Anderson created what he called a Yurt RV. 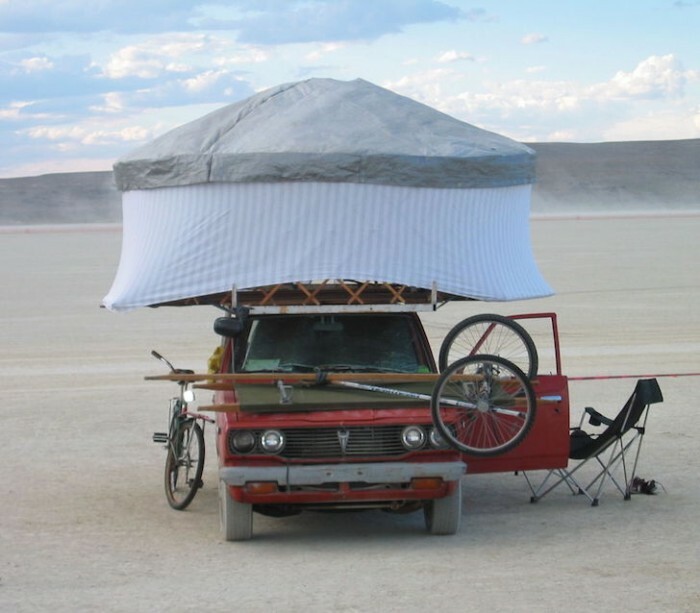 This is a combination yurt and truck was created specifically for the Burning Man Festival. This annual festival is a seven day event held in the Black Rock Desert in Nevada. Unless you come prepared, the strong winds can make for quite a dusty, unpleasant experience. Tim’s Yurt RV proved to be perfect for the festival. 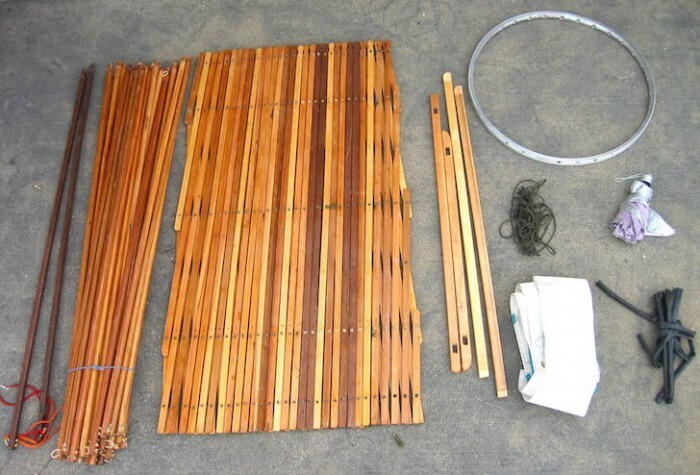 Tim posted his ten step plan for building his yurt on the website Instructables.com. These plans provide an excellent guide if you want to build a cheap — yet strong — structure. Tim used free supplies to make his yurt. He used hockey sticks to create the door frame. Most of the wood was scavenged from an old futon couch. He used a bicycle ring as the smoke ring in the roof. The wall lattice pivots are made from knotted cord. Tim’s design has no metal fasteners, and is approximately 10 feet in diameter. When assembled this yurt can hold several people at a time. It has roughly the same proportion as the traditional yurt structure; albeit scaled down. The yurt was assembled on top of the lumber rack on Tim’s truck. It was held steady on a platform of redwood boards. This design allowed Tim and his friends to move camp and drive around remarkably easily. Throughout the festival, Tim received numerous compliments on his yurt. If fact, many people told him that it was the best structure there. 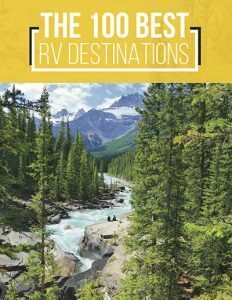 If you want to save more money and make your own RV, this yurt could provide the ticket to durable, affordable homemade RV. Pretty cool right? 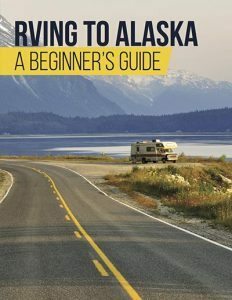 To read Tim’s full directions on how to make an RV Yurt, be sure to take a look at his post on Instructables.com.